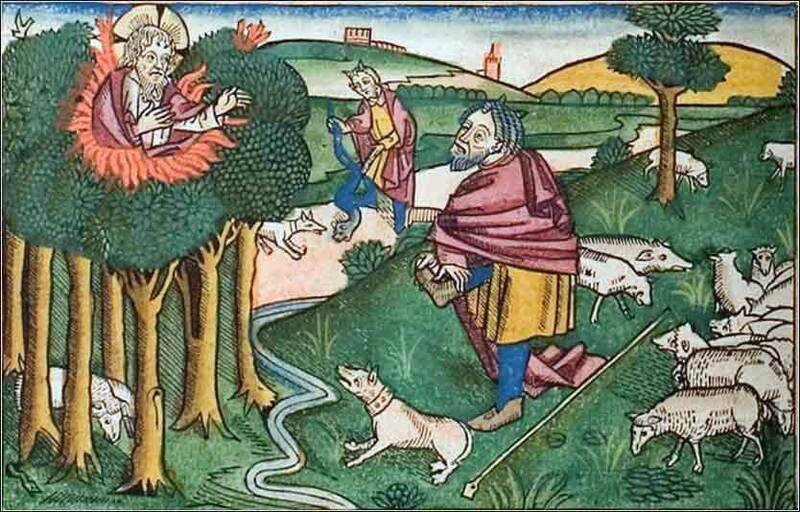 Woodcut of Moses and the burning bush from the 15th Century Koberger Bible. In this wonderful old tv clip, the Delta Rhythm Boys — known for their sense of humor — tell us what happened to some famous walls. Give us grace almighty father, so to pray, as to deserve to be heard, to address thee with our hearts, as with our lips. Thou art everywhere present, from thee no secret can be hid. May the knowledge of this, teach us to fix our thoughts on thee, with reverence and devotion that we pray not in vain. May we now, and on each return of night, consider how the past day has been spent by us, what have been our prevailing thoughts, words and actions during it, and how far we can acquit ourselves of evil. Give us a thankful sense of the blessings in which we live, of the many comforts of our lot; that we may not deserve to lose them by discontent or indifference. Hear us almighty God, for his sake who has redeemed us, and taught us thus to pray. Now Moses was keeping the flock of his father-in-law, Jethro, the priest of Midian, and he led his flock to the west side of the wilderness and came to Horeb, the mountain of God. And the angel of the Lord appeared to him in a flame of fire out of the midst of a bush. He looked, and behold, the bush was burning, yet it was not consumed. Moses, who would become the greatest prophet of God until the coming of Christ Himself, is different from most of the holy figures in the Bible, because he is an ordinary man, ridden with faults. His early life was unusual but not necessarily supernatural. Unlike almost every other Old Testament prophet, his early life was characterized by neither great righteousness nor signs of a great destiny. God has, in fact, been silent for centuries. And now, at a fairly advanced age, he is happy to live out his life as an escaped criminal, in the mean prosperity of a shepherd, grazing his father-in-law's herd in the margins of the civilized world. Perhaps it is related to Moses' worldliness, but compare how God presents Himself to Moses as opposed to, say, Abraham or Mary, whom He approaches as a warm friend. Moses is contacted by a rather terrifying vision, not in human form; the burning bush does not come to him, but commands him to approach in humility and reverence. If you consider the rude "Hello" Paul got on the road to Damascus, it seems that the way in which He approaches people has much to do with their godliness. But Moses is no Saul/Paul; he is not horrendously sinful, just a bit slack. He has simply been living his life as if God did not exist. Unlike Adam, when God calls him, he does not try to hide; he is not a purposeful sinner, trying to hide from God. When the Lord calls him, Moses says "Here I am" and obeys in fear and wonder. Fear of God, as Proverbs tells us, is the beginning of all wisdom, and Moses is at the beginning of his relationship with God. The bush is symbolic; for like the bush, Moses is touched by God's firey hand, but not destroyed. And similarly, the Hebrews will suffer God's wrath, but He will not destroy them. The bush foreshadows God's treatment of Moses and the Hebrews. 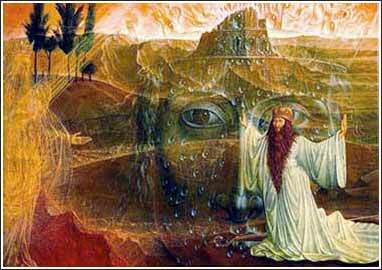 Moses and the Burning Bush by Ernst Fuchs.